I don't know what is different this time, but I am not struggling with the Whole 30 at all this time around. No boredom, no urge to break it. I think something that has been really helpful is trying to see the Whole 30 as a series of positive statements. "I can eat this," "I can make that," rather than focusing on the list of things I can't have. At this point, I am not craving my usual unhealthy favorites at all, because I try to make new recipes all the time and keep what we are eating delicious and exciting. Also, I think after my experience the first time, I know a bit better what to expect, and I can plan my meals in a way that best satisfies my needs. Less snacking, more focusing on what hunger really is and if that is, in fact, what I am feeling (rather than boredom, stress, etc.). Tomato olive chicken. A favorite of everyone's - even the baby, who picks out the olives and eats those first. It comes out amazingly well in the crockpot. 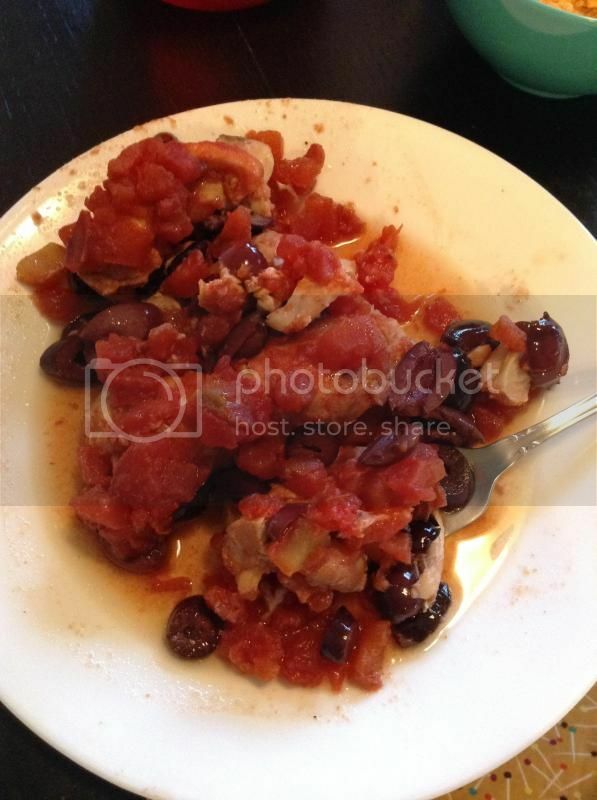 I do a can of no salt added diced tomatoes, then six chicken thighs, then a half a cup of sliced kalamata olives (no liquid), then another can of no salt added diced tomatoes. Let it cook on low for 6 hours. It is SO delicious. The meat just falls apart. Another big favorite in our house is shepherd's pie, made with mashed cauliflower. 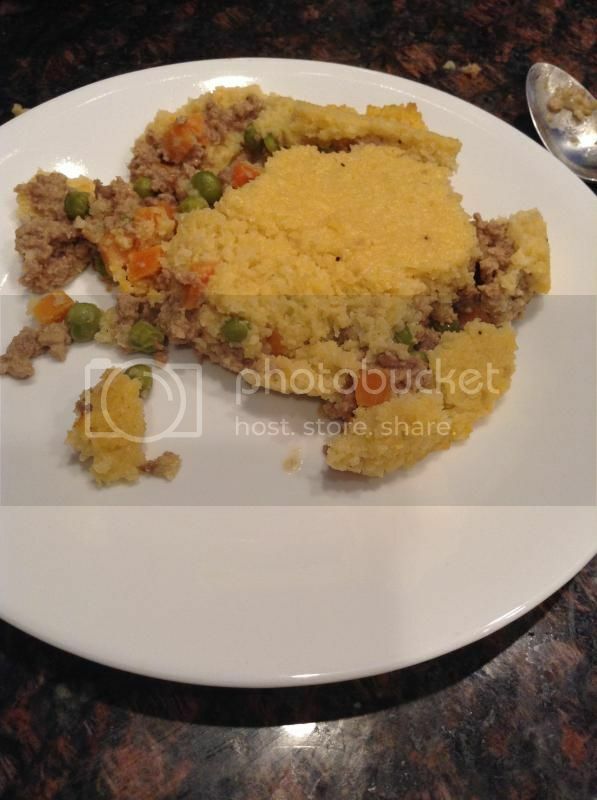 I usually do ground turkey and shredded carrots in the filling but we were out of carrots so I used a bag of frozen veggies - only problem is, it was peas and carrots, and I forgot that peas are technically legumes and so they are not allowed on the Whole 30. For the 10 peas I'm guessing were in my plate, I am going to just shrug it off and keep going. A spoonful of peanut butter would be breaking the Whole 30. This was an accident, and I'm moving on. This was a spur-of-the-moment invention of mine. We had a spaghetti squash and I made homemade tomato sauce to make sure everything in it was compliant (tomatoes, onion, garlic, basic, oregano, black pepper - turned out really well!). I wanted to make meatballs too, but I usually add breadcrumbs to my meatballs to hold them together well. I looked in the pantry to see what we could add - sometimes I will put nuts (usually pecans) in the food processor until they are almost a powder and use that, but we were out of everything except whole almonds and cashews (not quite the flavor I was looking for). So I used a scoop of chia seeds. They were actually really good, and incredibly filling - I couldn't finish my plate. For this week's lunches, I made Asian-inspired burgers with roasted broccoli and cauliflower. The burgers I made with ground pork, ground shrimp (I just threw cooked shrimp in the food processor and pulsed it for 10-15 seconds), sesame seeds, ginger, garlic, and green onion. I didn't get a picture - it didn't really come out looking beautiful, but oh my goodness, they're delicious. I've made it before as wonton filling, with a bit of soy sauce. No soy in the Whole 30 though, but it doesn't taste like anything is missing. I also didn't get pictures of this week's breakfasts but I made egg muffins to which I added smoked paprika and cut up pieces of Applegate beef hot dogs. They're pretty expensive and definitely a "sometimes" food, but it's a pretty good once-in-a-while change from the usual. I didn't make my weekly workout goal this week - I did 102% the first week, 110% the second week, but only about 77% this week. I had to stay late at work one day, so that was a missed workout, and then I missed yesterday's workout too - I woke up the other day with a few bug bites on my legs and arms so we spent the weekend deep cleaning every inch of our house, washing every sheet, blanket, pillow, and piece of laundry in hot, hot water. Not a lot of fun, but it had to be done. I am headed to the gym now, and after, my husband and son will come pick me up. His brother (my brother-in-law) is coming to town for a few days to visit. I am glad to have a plan for compliant eating while he is here. Steak with mashed potatoes (sweet for me) and Brussels sprouts tonight, compliant tandoori chicken with asparagus tomorrow. The boys will go out for lunches if they want. I am feeling incredibly well prepared, strong, and untempted. Just a little more than a week left! That's awesome!! I'm starting tomorrow and need to go for a major grocery shop tonight. I'm only doing a Whole 24 because I have a wedding to go to in October, and I don't want to miss out for the Whole 30. I am then hoping to do another few weeks. We'll see! My cousin started hers today (her first) so it'll be nice to have someone doing it along side me. I love the mental shift you have made. You're doing great! You post the very best meals ever! 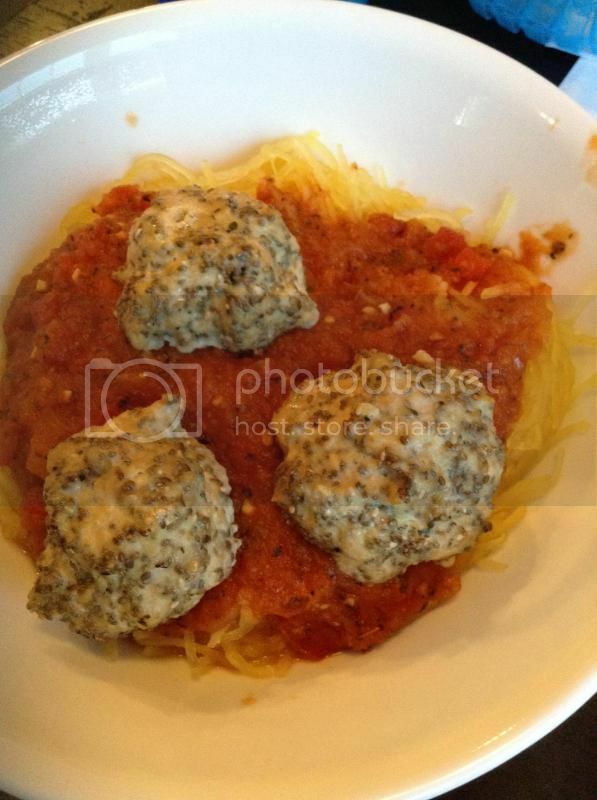 I am so in the mood for spaghetti squash. I am having the same experience as you are having (although my food plan is not quite as restrictive as yours and is much more long term.) This doesn't seem hard and in the past, it has always required white knuckling through each and every day. I can only conclude for me that it is easy because I don't have any sugar and no carbs that readily convert to sugar. Now my body is relaxed and I get satiated very easily. In the past, Halloween would undo me every year. This year, I really don't think it will be hard not to treat myself to the trick or treaters loot. I'm glad you are feeling so much better about it this time around. Go you! And your meals look delicious!